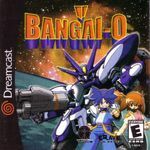 Bangai-O in its Dreamcast Western release, or Bakuretsu Muteki Bangaioh (爆裂無敵 バンガイオー, Bakuretsu Muteki Bangaiō, Explosive, Invincible Bangaioh) in the Nintendo 64 and Dreamcast Japanese versions, is a multi-directional shooter video game developed by Treasure. It was first released on the Nintendo 64 only in Japan with a limited 10,000 unit production run. It was converted to the Dreamcast a few months later, and this version was eventually released worldwide; The latter version is much more widely available, and thus better known. Bangai-O, the player's mecha, is maneuvered via eight-way directional controls and fires in eight directions, controlled by the controller's four face buttons. There is a life bar and the levels can be retried from the beginning after dying. Two firing modes are represented as switching between the two pilots (the current one is displayed at all times in a portrait): Riki fires red homing missiles and Mami fires blue lasers that bounce off walls. There is a special attack that consists of a 360 degree burst of the current shot type. The number of shots fired by the special attack, 40 to 400, depends on how many enemy bullets are on the screen and how close the player is to them while firing. The missile special attack splits between multiple targets; the laser special attack points towards a target after bouncing. At the beginning of a level two special shots are available; destroying enemies and scenery gives additional uses, up to five available shots, and this recharging effect is shown as a meter.